“I am so glad we moved to the Bush, Papa. I can't wait to go exploring and see a kangaroo,” Narelle said. Narelle put on her hat and headed out of the door. “Take care of the sheep, Papa.” She shut the door behind her. “I won't.” Narelle skipped down the dirt road. She came to a wide river where hundreds of flamingos stood on one leg. “What pretty pink birds. I wonder if Papa will let me have my very own flamingo.” After she watched them for a while, she walked down along the river bank. “What's that? It looks like a crocodile. I hope it doesn't eat the flamingos.” Narelle was relieved when the crocodile disappeared under the water. It hopped away, leaving her stranded in the middle of nowhere. “I wonder where I am and where our new house is.” She looked all around her. “Papa! Papa!” She shouted loud, but there was no answer. “I hope there aren't any snakes around here.” Narelle walked towards the sun. She came to a bush. “What's this? It looks like a peach tree.” She picked one of the fruits and bit into it. “I remember now. These are called quandons. Papa told me about them.” She ate two more and picked another six, stuffing them in her pockets. On and on she walked. “I am going on a walkabout. I hope I get home before the sun goes down.” But she didn't. In the darkness she wandered. Something black and hairy ran in front of her. “What are you? Are you a wombat?” The creature didn't stop, but ran on. She curled up on the stone and fell asleep. When she woke up she heard a hissing sound. A brown snake sat just off to the side of the stone. “It's a snake. I'll bet it's poisonous.” She saw that the sun was coming up over the horizon. “I'm not waiting to find out.” Without another moment's hesitation, she jumped off the stone and ran back the way she'd come. She didn't stop running until she got to the river. “Narelle! Narelle!” Papa called to her and came running. “Papa! You found me.” She hugged him with both arms. “I was worried sick. When I told you to go on a walkabout, I meant in our back garden, not the entire bush. At least your safe now. Did you see any Bush animals?” Papa took her hand. “Oh yes, Papa. I saw kangaroos and koala bears. 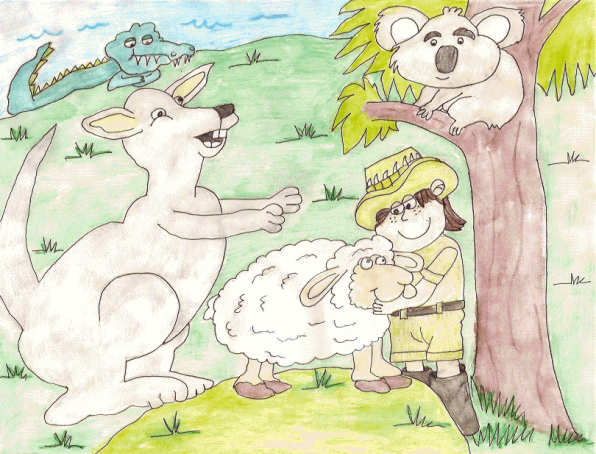 I saw a brown snake, a wombat, flamingos and a crocodile.” Narelle beamed with a smile. “Why don't you come back to the house and you can play with the sheep. I think the next time you go on a walkabout, I should come with you.” Papa headed for home. “I think so too, Papa.” Narelle squeezed her papa's hand and followed him home.